The Lacquerista Therapista: Happy New Year! Happy New Year! Boy, 2014 really flew by! Starting a new year always feels like a fresh start, even though it's just an arbitrary time. Last year, one of my goals was to enjoy life a bit more--to live in the moment. I think I accomplished that for the most part. It wasn't perfect, but I'm getting better at it. This year, I am going to work on "trimming the fat." Figuratively speaking, I want to remove unnecessary stress from my life to improve my ability to live in and enjoy the moment. I will also be continuing my pursuit towards a healthy lifestyle. Last year yielded some successes and some challenges on that front. This year will be even better. Lastly, it's time to focus some attention on future goals. More posts, perhaps! Okay, on to the nails. This is my New Year's mani. Gold, silver, black, and sparkly! I originally intended for this mani to be done with chunky glitter so I started with Nail Pattern Boldness Glitter-A-Peel base coat so that I could remove it easily. Wound up not using chunky glitter, but stayed with the peel-off basecoat since I figured I'd probably change out my mani soon, anyway. Zoya - Ziv is on the index and pinkie and Zoya - Trixie is on the middle finger. To make it more sparkly, I layered Butter London - Tart with a Heart and China Glaze - Fairy Dust over each. Ring finger is Orly - Liquid Vinyl. 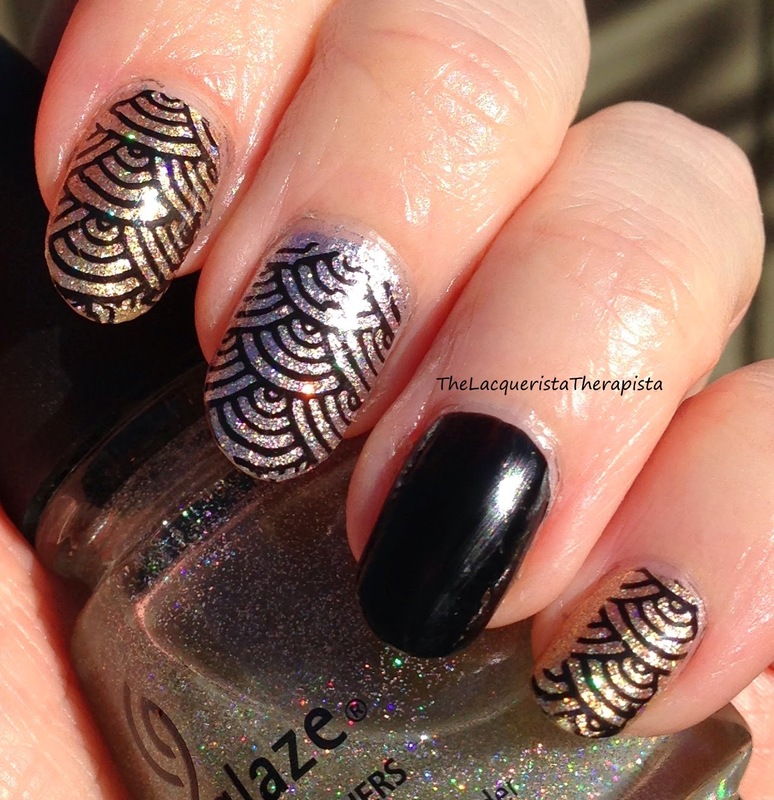 For the art deco look, I used a stamp from Vivid Lacquer (VL 031) with Konad stamping polish in black. Each nail has a coat of Seche Vite top coat. My camera struggled to capture the true sparkliness of this mani so I included a blurry photo that gives a slightly better view of the holographic glitter goodness. Thanks for reading! Here's to a fresh new year full of good times, new experiences, and pretty nails! Is there something you'd like to see (or see more of) on my blog this year? Comment below to let me know!